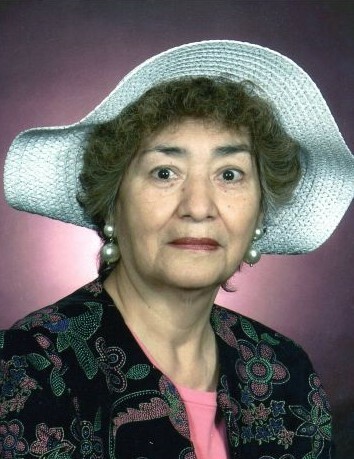 Maria Theresa Montes, age 82, of Auburn passed away on Saturday, December 1, 2018 at 12:05 PM peacefully at Betz Nursing Home in Auburn. She was born on May 20, 1936 in Austin, Texas. Mom loved to sing and write her thoughts on paper. She was bilingual, loved to wear hats and her favorite movie actress was Katherine Hepburn. Daughter and son-in-law; Mary Helen and Antonia Perez of Fort Wayne. Daughter and son-in-law; Rose Mary and Steve Sponhower of Auburn. Daughter and son-in-law; Mary Lou and Raymond Scott of Butler. Daughter; Kathleen Jane Ross of Auburn. Son and daughter-in-law; Henry M. and Brenda Ochoa of Butler. Son; James John Whitman of Butler. 12 grandchildren. 27 great grandchildren and 4 great great grandchildren. Brother and sister-in-law; Alex and Janean Laguna of Wildmar, California. Sister and brother-in-law; Mary Ester and Raul Rubalcada of Fort Wayne. Brother; John E. Laguna of Fort Wayne. Brother and sister-in-law; Michael and Randi Laguna of New Haven. Brother; Ralph Laguna Jr. of Dallas, Texas. Sister; Susan Laguna of Fort Wayne. She was preceded in death by her mother; Maria Gomez, her father and step-mother; Rafael and Julia Laguna, 2 sons; an infant, Eddie and Bobby Jarrod Ochoa and 5 brothers; Johnny, Rauly, Gilbert, Joseph and Henry Laguna. Visitation will be held on Wednesday, December 5, 2018 from 3:00 to 7:00 PM at the Feller and Clark Funeral Home, 1860 South Center Street in Auburn. Funeral services will be held on Thursday, December 6, 2018 at 2:00 PM at the Feller and Clark Funeral Home in Auburn. Memorials may be directed to American Diabetes Association, 2451 Crystal Drive, Suite 900, Arlington, Virginia 22202.